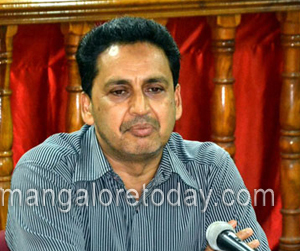 Mangalore, Sep 19, 2014: Chairing a meeting, DK DC A B Ibrahim directed officials of Mangalore Urban Development Authority (MUDA) to clear files pertaining to the development of markets in Urwa and Urwa Store. He said that there is a notion that MUDA officials are deliberately not clearing the files. Any proposal or applications seeking permission should not be delayed. The MUDA meeting should be convened on every third Saturday.The DC directed the MUDA to prepare a report on the development of lakes in Mangalore city. MUDA Commissioner Mohammed Nazeer said that market and commercial complex proposed on 55.40 cents land at Urwa will cost Rs 11.12 crore. The PWD has been entrusted the task of preparing a detailed project report. The detailed project report will be submitted to the Urban Development department for approval shortly. MLA J R Lobo said that he will make an effort to get administrative approval for the markets at Urwa Store and Urwa. MLA Mohiuddin Bava said that the work on construction of markets at Katipalla Kaikamba, Krishnapura and Kavoor should be initiated at the earliest. MLC Ivan D’Souza among others were present.